I’ve written a few posts in recent weeks highlighting some of the more interesting finds encountered during two visits this past July to the White River Hills region of extreme southwestern Missouri. It’s a land of extremes, with deeply dissected layers of limestone/dolomite bedrock supporting xeric glades, dry woodlands and riparian watercourses. The hilltop glades (“balds”), in particular, feature prominently in the region’s natural and cultural history and are the most extensive system of such habitat in Missouri. They support a number of plants and animals more characteristic of the grasslands of the south-central U.S., such as the recently featured Megaphasma denticrus and Microstylus morosum, North America’s longest insect and largest robber fly, respectively. Sadly, the glades in this region are much reduced in size and quality compared to their pre-settlement occurrence, primarily due to overgrazing and suppression of fire. These anthropogenic forces have combined to reduce overall vegetational diversity and accelerate encroachment by woody species (chiefly eastern red-cedar, Juniperus virginiana). Nevertheless, there still remain several high quality glade remnants in the area, and the public agencies charged with their conservation are increasingly utilizing mechanical removal of woody growth, controlled burns, and managed grazing in an effort to simulate the natural forces that mediated this landscape for thousands of years. My reason for returning to the White River Hills this year was simple—find and photograph the magnificent longhorned beetle, Plinthocoelium suaveolens (family Cerambycidae). 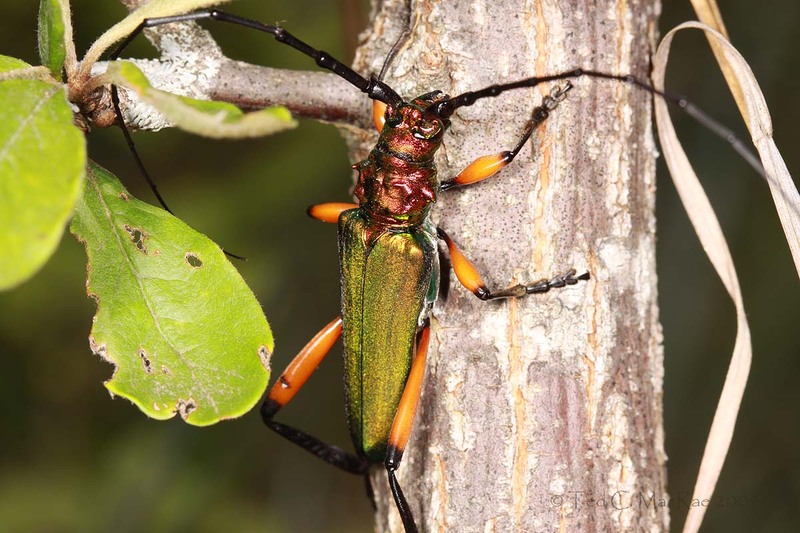 This species, occurring across the southern U.S. from Florida and Georgia west to New Mexico and Arizona, is truly one of North America’s most beautiful longhorned beetles due to its large size, brilliant iridescent green coloration, and super-elongate wildly-contrasting orange and black legs. Until recently, this species was known in Missouri only from sporadic records across the southern part of the state (MacRae 1994). I knew of its association with gum bumelia (Sideroxylon lanuginosum [= Bumelia lanuginosa], also called gum bully and woolly buckthorn), which was first noted by Missouri’s first State Entomologist, C. V. Riley (1880) and later discussed in detail by Linsley and Hurd (1959) and Turnbow and Hovore (1979); however, my repeated searches over the years whenever I encoutered this plant came up empty. 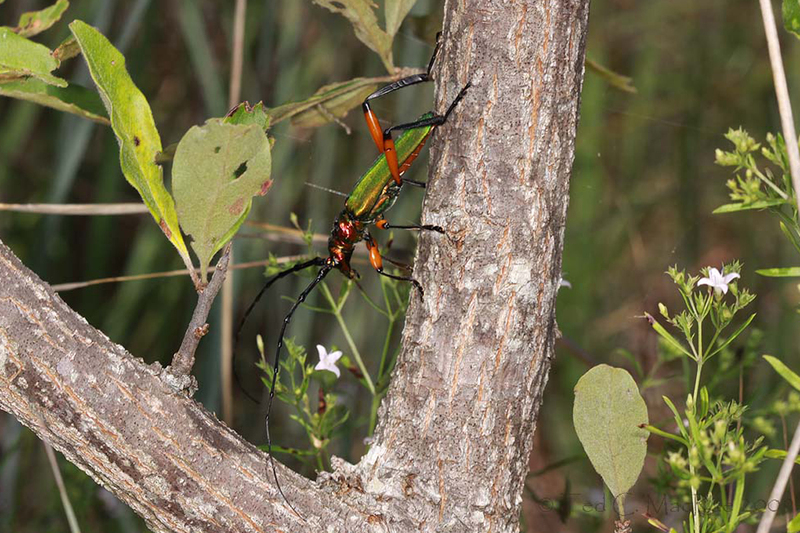 A few years ago, Chris Brown and I were conducting a survey of tiger beetles in the White River Hills and noted the relatively common occurrence of bumelia on these glades. Bumelia, like P. suaveolens, is one of only a few North American representatives of a largely tropical group, and it is one of the few woody species naturally adapted to the xeric conditions found on these glades. Recalling the association of P. suaveolens with this plant, and also recalling that adults could be attracted to fermenting baits of the type described by Champlain and Knull (1932), we placed fermenting bait traps on several glades in the area and succeeded in trapping a number of individuals during the month of July. 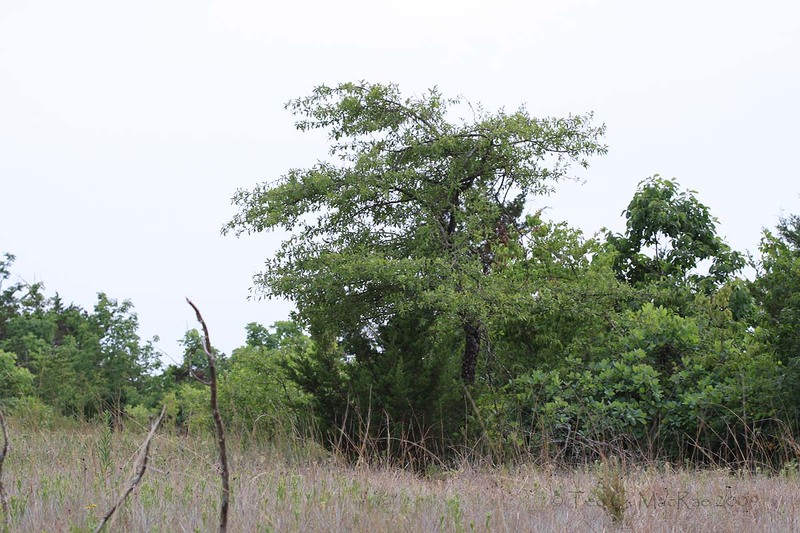 When I began searching the bumelia trees at these glades, I found adults perching on the lower trunks of several trees. It was the first time I’d seen live individuals of this species in Missouri. At the time I was not a photographer, and that experience became one of the many moments that I would later look back upon and think, “If only I’d taken a picture of that!” Thus, at the end of June this year, having successfully found Cylindera celeripes in Missouri on the first day of a planned 3-week search, my attention immediately turned to the new goal of finding P. suaveolens and photographing it on its host plant. I knew this wouldn’t be easy—the beetles were not abundant when I had last observed them, and those that I did find were quite wary to my approach. Getting within striking distance with a net was one thing; doing so with a camera and macro lens would be another thing entirely. In my first trip to the area (early July), I went to Chute Ridge Glade, a magnificently restored glade in Roaring River State Park where I had seen the greatest number of individuals before. I was full of optimism on that first day as I zigzagged across the rough terrain from one bumelia tree to the next, but my optimism began to wane as I cautiously approached each tree and saw nothing. Within an hour, I’d looked at every bumelia tree I could find on the glade and not even seen a beetle, much less attempted a photograph. 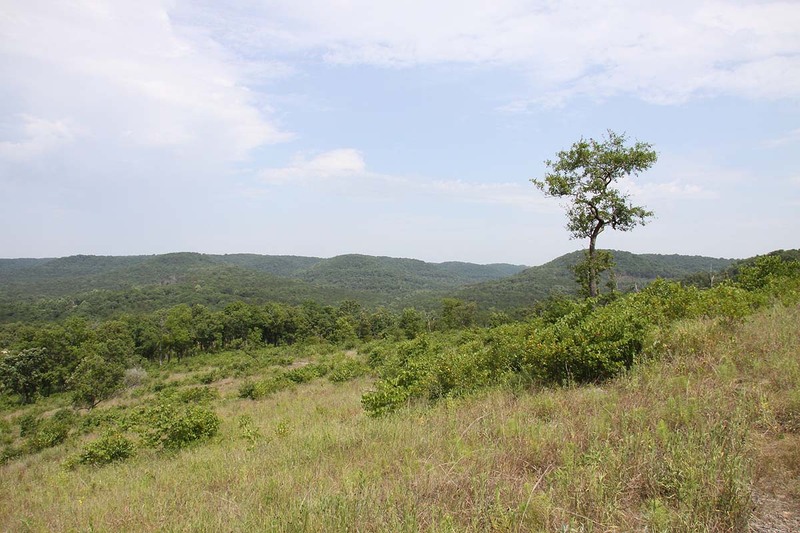 It would take a 2-hour drive along twisting back roads to reach the other sizeable glade complex where I had seen beetles before (Blackjack Knob in Taney County), and another hour of searching on several dozen trees would again yield nothing. By now I was feeling rather frustrated—the day’s oppressive heat and humidity had taken its toll, and my 4.5-hour drive from St. Louis was looling like it would be for naught. I had noted that the bumelia flowers were almost but not quite open yet—perhaps it was too early in the season still? The remnant glades at Blackjack Knob are more extensive than those at Chute Ridge, so many more trees still awaited examination—if I could only muster the energy! I trudged back to the truck, guzzled a nice, cold Powerade, and started off in another direction. I looked at a number of trees and still had seen no sign of the beetle, but on one particular tree I noticed an enormous pile of sawdust on the ground at the base of the tree. 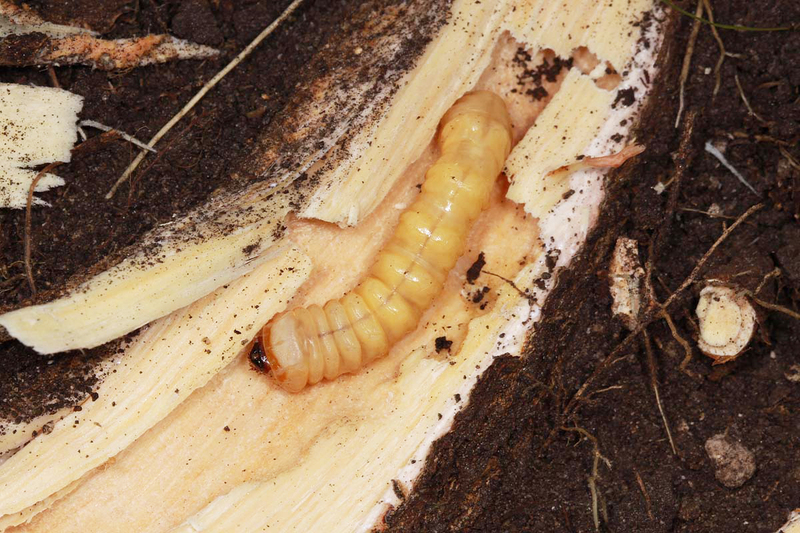 I looked at it more closely and saw that it had the rough, granular texture so characteristic of longhorned beetle larvae that like to keep their galleries clean, and its bright, moist color suggested that it was being ejected by a larva tunneling through living wood. I looked up into the tree above the pile to find where it was coming from but could find no ejection hole. I checked the base of the trunk itself and still couldn’t find anything. Then I started poking into the pile and felt a root. Further poking revealed a soft spot on the root, and I immediately knew that I had found a P. suaveolens larval gallery—no other cerambycid species is known to bore in roots of living Sideroxylon, especially one as large as this based on the size of the frass pile. I hurried back to the truck and grabbed my hatchet, returned to the tree, and scraped away the soil above the root to find an obvious ejection hole a few inches away from the base of the trunk. I started chipped into the root at the ejection hole and found a large, clean gallery extending down the center of the root away from the trunk. About 18” away from the trunk I found it—a large, creamy-white cerambycid larva. Finding a P. suaveolens larva was gratifying, but it wasn’t what I had come here to do, which was photograph the adult. After placing the larva live in a vial for preservation later on (dropping into scalding water to “fix” the proteins and prevent discoloration when stored in 70% ethanol), I continued searching the trees for adults. I found one tree on which the flowers were just barely beginning to open and collected a few of the pedestrian species of scarabs that are attracted to bumelia flowers in droves when fully open (e.g. Cotinis nitidus and Trigonopeltastes delta)—for the record. There was still no sign of adult Plinthocoelium, and I was on the verge of calling it a day when I approached another tree and saw it! I froze, then slowly geared up with the camera and started stalking slowly towards it. It was not in a very convenient location, down low on the trunk and partially screened by foreground vegetation. I got close enough to start attempting some shots—not ideally composed, but just to ensure that I had something before I tried to get any closer. After the third shot, however, it became alarmed and started to flee, and I had no choice but to capture it for a “studio backup.” That taste of success gave me the motivation to resume my search, but no additional beetles were seen before a dropping sun put an end to the day. Not entirely satisfied with the shots that I’d gotten, I returned to Blackjack Knob the following day and also searched some of the extensive habitat at nearby Hercules Glades Wilderness. I wouldn’t see another beetle the entire day, although encountering a nice series of Cicindela rufiventris (red-bellied tiger beetle) was some consolation for suffering the day’s oppressive heat and humidity. I still had the live beetle, so I placed my hopes on getting better photographs of the beetle in confinement after returning home. That would not come to pass—the beetle refused to sit obligingly on the stick I placed in the large screen cage, and instead clung to the cage itself. For days I watched it, giving it honey-water for sustenance and waiting for an opportunity to photograph it on the stick on which it refused to sit. It became clear to me that studio photographs, at least in the manner I was attempting, would not be possible. Not entirely satisfied with having seen only a single beetle on my trip, and thinking that I may have been too early based on the flowering phenology of the bumelia host trees, I did what any dedicated entomologist would do—I made a second trip to the area two weeks later! I didn’t mess with Chute Ridge Glade this time, instead making a beeline for Blackjack Knob right away. Unfortunately, the weather was uncooperatively drizzley (I would have preferred hot and humid to rain!). Nevertheless, daughter Madison and I made our way to the glades and began inspecting the trees that I had just examined two weeks earlier. I noted immediately that the bumelias were now in full flower, and it wasn’t long before I saw the first adult flying into these flowers. Exciting for sure, and this was a good sign to see an active adult despite the drizzly weather, but the situation of the beetle on a high branch left no possibility for photographs (and only with a rather acrobatic swing of my fully extended net handle amidst a jumble of dead branches was I able to capture it). This same scenario would replay several times over the next two hours before rain finally drove us back to the car. In total, we saw half a dozen active adults, but in each case they were seen flying to flowers on high branches and could not be photographed. Despite that disappointment, I’ll never forget the spectacularity of seeing these beetles in flight—shimmering green and bold orange, with legs and antennae spread wide in all directions. I was also fortunate to find another tree with a fresh frass pile at its base indicating an active larva. This time, I cut the tree some inches above the ground and extracted the trunk base and root intact for transplanting into a large soil box upon my return home. The appearance of new frass on the soil surface afterwards confirmed that I had gotten the root containing the larva and that it had survived the extraction and transplanting. Hopefully I will be able to successfully rear this individual to adulthood. Despite the rain, we then went back to Hercules Glades Wilderness to see if luck would follow suite there as it had at Blackjack Knob. It didn’t, as rain continued to doggedly pursue us, but the day was not a total loss as daughter and I got in a nice 7-mile hike through some of Missouri’s most ruggedly scenic terrain and were rewarded with the sighting of a western pygmy rattlesnake. The next day was sunny, much to our delight, and I considered going back to Blackjack Knob where we had seen a good number of adults the previous day. In the end, I decided I’d played that card and rather than continue trying for photographs I’d rather see if the beetle could be found at another glade complex further to the east at Long Bald Glade Natural Area in Caney Mountain Conservation Area. Things didn’t look promising, as I found bumelia trees occurring only sporadically across the main glade complex—with no sign of the beetles. Nevertheless, we enjoyed the day and spent a bit of time chasing after some enormous robber flies that later proved to be Microstylum morosum, a new record for Missouri and a significant northeastern range extension. I thought that would be the highlight of the day, but as we were heading back to the car I spotted a small glade relict on the other side of the road. It was overgrown and encroached, apparently not receiving the same management attention as the glades in the main complex. Regardless, I went over to check it out and immediately spotted several bumelia trees amongst the red-cedars, and within minutes I saw a beetle—low on the trunk of a very small bumelia tree! Once again I froze, then slowly geared up with the camera and began my ultra-cautious approach (remember, this was only my second photo chance after a combined four days in the field). Like last time, I took one shot while still some distance away, then moved in for closer attempts. Unlike last time, there was no bothersome vegetation cluttering the view, and when I moved in for closeups the beetle turned around, crawled up the trunk a short distance, and then paused. I snapped off a small series of shots while it sat there, and then suddenly it became alarmed and flew away. Though still not perfect, these photographs were better than the previous ones I had obtained (check out the pronotal armature in the last photo! ), and the finding of this species at Long Bald Glades also represented a new county record. Missouri populations are assignable to the nominotypical subspecies (southeastern U.S.), which is distinguished from subspecies plicatum (Texas, New Mexico, Arizona, and northern Mexico) by the bronze or cupreous tints and weak transverse rugae on the pronotum (Linsley 1964). The distributional ranges of the two subspecies intermingle in northeastern Texas. Photo 1 (Chute Ridge Glade): normal mode, ISO-400, 1/250 sec, f/16, natural light. Photo 2 (Sideroxylon lanuginosum): landscape mode, ISO-100, 1/160 sec, f/6.3, natural light. Photos 3 (P. suaveolens larval frass pile), 6—8 (P. suaveolens adult): manual mode, ISO-100, 1/250 sec, f/9-11, MT-24EX flash 1/2 power through diffuser caps (photo 7 slightly cropped). Photos 4—5 (P. suaveolens larva): manual mode, ISO-100, 1/60 sec, f/14 (closeup f/25), MT-24EX flash 1/2 power through diffuser caps. Champlain, A. B. and J. N. Knull. 1932. Fermenting bait traps for trapping Elateridae and Cerambycidae (Coleop.). Entomological News 43(10):253–257. Linsley, E. G. 1964. The Cerambycidae of North America. Part V. Taxonomy and classification of the subfamily Cerambycinae, tribes Callichromini through Ancylocerini. University of California Publicatons in Entomology, 22:1—197, 60 figs., 1 pl. Linsley, E. G. and P. D. Hurd, Jr. 1959. The larval habits of Plinthocoelium suaveolens plicatum (LeConte). Bulletin of the Southern California Academy of Sciences 58(1):27–33. MacRae, T. C. and M. E. Rice. 2007. Distributional and biological observations on North American Cerambycidae (Coleoptera). The Coleopterists Bulletin 61(2): 227–263. Riley, C. V. 1880. Food habits of the longicorn beetles or wood borers. The American Entomologist 3(10):237–239. Turnbow, R. H. Jr. and F. T. Hovore. 1979. 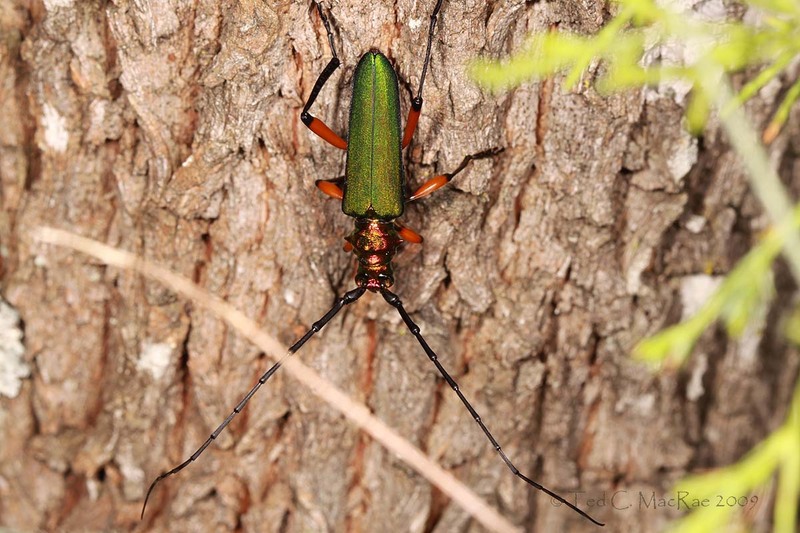 Notes on Cerambycidae from the southeastern U. S. Entomological News 90(5):219–229. This entry was posted in Cerambycidae, Coleoptera, Sapotaceae and tagged beetles, behavior, Botany, entomology, glades, immatures, insects, landscapes, longhorned beetles, Missouri, nature, North America's most..., Ozarks, science, taxonomy, trees. Bookmark the permalink. Another wonderfully written and fascinating post – it reminds me of how much I’ve missed being able to keep up with your blog. I was rooting for you to find Plinthocoelium suaveolens at Hercules Glades, because it’s an area I’ve visited fairly often, but, sigh, no. The entire expedition sounds like it was both frustrating and exciting, as any good expedition should be. 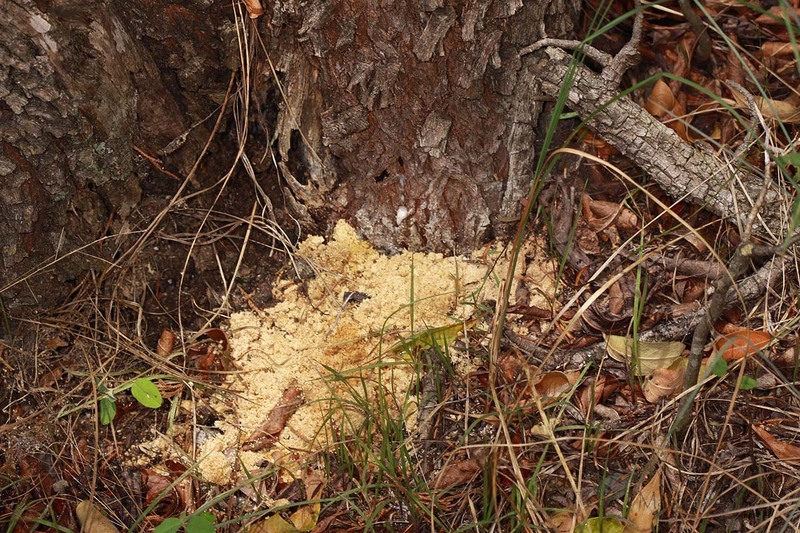 I’m sure Plinthcoelium occurs at Hercules Glades – I did find a tree there with a fresh larval frass pile at its base during the first trip, but it was too large to cut down and extract for an attempt at rearing. The second visit there it was just too rainy for the beetles to be very active, and my daughter and I were more focused on our hike than looking for the beetle. Nice photographs of a beautiful beetle. When I read your title, I was expecting a post about Trachyderes mandibularis. Next summer I am going to have to get down to Missouri and get out into the field with you. Thanks, Doug. There are several beetles that could possibly compete with Plinthocoelium for that title – you mentioned one, and others are Callona rimosa and Crioprosopus magnificus. Of course, none of them occur in Missouri. Please do come here sometime – I’d love to show you what we’ve got! Truly marvelous. What more can be said about an animal that leaves one nearly breathless? Well done, Ted! Thanks, by the way, for the extremely informative reply on our blog. Your expertise is always appreciated. Thank you, K&R, for your very kind comments, and it is always my pleasure to contribute comments on your blog when I think I can be helpful. You’re right: What a beautiful insect! I’m glad you decided to keep looking. That last picture especially brings out the stunning artwork of this creature. And I’ll admit I was tickled by your frustration with the captured critter who refused to pose on the stick. It just sounded terribly funny: this image of you standing there day and night, offering sustenance and shelter, and still winding up disheartened by a beetle who wasn’t seeing things your way. That stalemate resulted in fantastic images from the wild, so I think that battle of wills worked in your favor. I’m glad the combination of frustration and elation came through in the story – overcoming the challenge is half the fun! Ted as usual awesome pics. Very nice write-up, Ted. You have given honor to this beautiful species! My experience in Texas is that they are most abundant at the base of Bumelia trees in August and during the hottest part of the day (between 2-4 PM). They are indeed very alert, maybe more-so than any other longhorned beetle I’ve collected. Almost as bad as bups! You can spot one and very carefully walk to within 8 feet or so and then it suddenly twitches its antennae and changes its posture. At that moment, you know you’ve been detected and then it’s a 50-50 proposition, at best, to collect it before it zips away. Hi Steve, thanks for stopping by. Yes, extremely wary is the word – I think photographing tiger beetles “pre-adapted” me to meet the challenge posed by this gorgeous creature. Thanks, Beau. At the time (before the success) it seemed like a big waste of time, but looking back on it now it was an experience to savor. Tiger beetles are out – only certain species, though. The six-spotted tiger beetle that people notice so commonly in the woods during spring is not one of them. I’m leaving Friday for a quick blast out to western Oklahoma (where I had so much success back in June) to play a hunch on some other species that I think (hope) might be there. European hornets, like all introduced species, are a bummer. But one time I watched one nab a huge differential grasshopper in mid-flight, and after a stinging tussle on the ground proceeded to butcher it with machine-like efficiency. It ate the head on the spot, then flew off carrying the thorax. I suspected it might be back for the abdomen which it had left behind, and sure enough about 5 minutes later it returned, did a low-flying circle to locate the booty, then grabbed it and flew off. Nothing left but four wings and six legs scattered on the ground and my friend and I staring at each other with our jaws agape. It was quite a sight! A marathon review this time! Very interesting cerambycid. Nothing like it over here and the host is not represented here either! Thanks, Trevor. Plinthocoelium is a member of the tribe Callichromatini, which is represented in Australia by Chloridolum cinderellum from the northeast coast (McKeown 1947). I haven’t seen images of that species, but other species of the genus are every bit as gaudily-colored as Plinthocoelium. Bumelia is a member of the pantropical Sapotaceae, and while I don’t know if other callichromatine beetles are associated with plants in this group, the family is represented in northeast Australia by the genera Chrysophyllum and Pouteria. Perhaps there is a relationship? This post made for a great read – and what a most spectacular cerambycid it is; in size, form and colour. Grats on the find! If I lived on the north-east coast of Australia (I am in the southwest) I would have a look around for Chloridolum cinderellum or some of the others in the family, but alas. Yes, there is a wonderful array of buprestids down here, unfortunately I struggle to get good photos of many of them. I did find one especially beautiful one, but sadly it was already dead. I’ve photographed a few buprestids, but not nearly what I should considering they are a group of primary interest for me. I know a few entomologists who manage to limit their interest to a single taxon. Limiting the scope of one’s studies is one thing, but to not even be interested in insects more broadly I don’t understand. As they say, beauty is in the eye of the beholder. Among others, I’d vote for the mimetic Necydalis ovipennis LeC. which I collected in the Chiricahuas in Arizona in June, but then I’m partial to mimetic species. I thought I might get some pushback for crowning this species as North America’s most beautiful, but I didn’t think it would come from a bup guy! 🙂 Yes, Necydalis are great – I’ve only seen one once (~10 years ago). I’d love to see another and get a chance to photograph it. Don’t know how I missed this one, but thanks to Circus of The Spineless, I found it. Hi Adrian – fun stuff. It was fun the first time I found the species, but this year’s hunt was much more memorable – perhaps because of the high bar I had set (actually photographing the adult on its host), or the great effort it took to make it happen. The first time I just stumbled onto it, netted a few, and off I went. i have a ton of these larvae in wood in my back yard, so many of them I have just been burning the wood pile because I didn’t want them all to hatch. 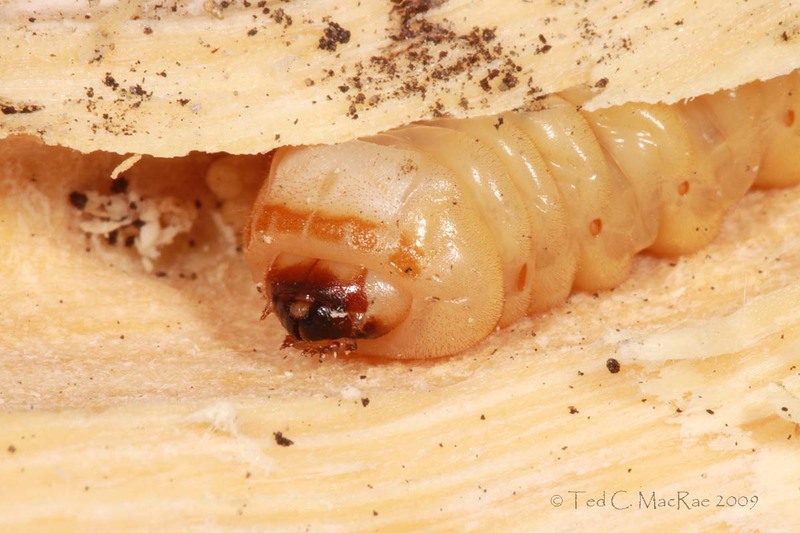 I have pictures where I split the wood for my stove and there were like 10 or 15 of these larvae in one piece. I have pics. Do I have to worry about an infestation of my trees? These beetles do not infest houses, and most don’t even infest living trees. The dead wood pile in your back yard is excellent habitat for these beetles – they not only help break down wood in the forest cycle but also provide food for birds and other animals. If you need the wood for firewood that’s fine, but don’t burn it out of fear the beetles might cause a problem. That is awesome stuff and an impressive species! I found one at work in Joplin Mo. I didnt onow what it was so I didnt want to touch it but I rolled up a piece of paper and used that to play with it for a few minutes. I took a few good pictures too.